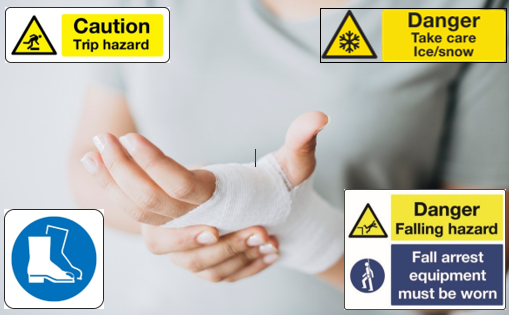 To combat these statistics, Surrey-based signage specialists Stocksigns Ltd has a wide range of outdoor construction safety signage in preparation for the weather taking a turn for the worst. Contractors and other people who oversee the control of a construction site must work together to manage the potential risks and eliminate these, allowing people to move safely around the site. Many individuals take traditional signage for granted across construction industry, but these are legal requirements by the Occupational Health and Safety Administration (OSHA) which requires employers to protect against these hazards in the workplace. The UK has an aging workforce, as the number of people aged 65 and over is projected to rise by nearly 50 per cent by 2024, and by 2050 a quarter of the UK population will be aged over 65, therefore the preparations for not only this winter, but future harsh weather conditions must be taken now. Stocksigns Ltd’s essential hazard signs help alert and warn of potential dangers in and around a site. Hazard signs cover three main areas; Danger, Warning and Caution dependent on the severity of the threat. Made available in aluminium and rigid plastic, the Stocksigns Ltd range of construction safety signage are fully compliant with ISO 7010. The signage specialists are committee members of the Heath and Safety Sign Association, as well as being an active supporter and partner of the Royal Society for the Prevention of Accidents (RoSPA). Managing Director of the Stocksigns Ltd, Danny Adamson said “It’s crucial for both employers and employees to be made aware of the risks when working in treacherous conditions outdoors. We have a duty as signage professionals to guide individuals in making the correct choices when implementing signage around a site, maximising the levels of safety and reducing the potential risks to themselves and others around them. To view the full range of safety signage for the cold months ahead, please visit the Stocksigns Ltd website here. Stocksigns Ltd started life as a screen-printing company in 1955 and have become the go-to company for the very latest in signage and digital printing. The business provides high quality signage for all situations and has made many bespoke pieces for places such as Gatwick Airport. This press release was distributed by ResponseSource Press Release Wire on behalf of Stocksigns Group in the following categories: Children & Teenagers, Men's Interest, Women's Interest & Beauty, Public Sector, Third Sector & Legal, Construction & Property, for more information visit https://pressreleasewire.responsesource.com/about.